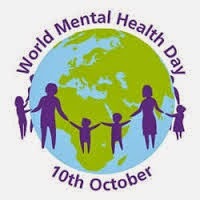 Loubee Lou Blogs: World Mental Health Day. So as an introduction to me and my new blog, I decided to incorporate World Mental Health Day by telling you a little bit about my story. Mental illness affects 1 in 4 people and yet it is still slapped with a stigma. My name is Louisa (although that name is rarely used. I go by Loubee) and I suffer with mental health issues. I am not an average 19 year old girl. I have missed out on a lot of things due to my severe social anxiety and depression. At the age of 16, I suffered a mental "breakdown" and I didn't really understand it at the time. I thought that I was fine. I was suffering with terrible migraines that meant I couldn't focus and I'd lost over 2 stone in weight from stress. I even took a trip to the doctors about my migraines and I was told to keep a food diary and avoid certain things like caffeine. Anxiety was never mentioned because of my age. I became very suicidal and felt like the whole world was judging me and I didn't like it. It all got too much for me and so for my own safety, I dropped out of college despite my love of learning and isolated myself from everyone around me. I didn't reach out for help because I didn't realise there was a problem. Mental health isn't the first thing that comes into your mind when you're in denial. No one approached me and asked if I was okay. In fact, quite the opposite. People complimented me on my weight which gave me a temporary ego boost and made me think I must be fine. I assumed that my friends would have asked me if I was alright but they didn't. Even if they did, I probably would have put on a fake smile and assured them I was doing well. But with isolation comes other issues. I may have been safe indoors but I was also becoming reclusive. Going out became harder and harder so eventually I stopped. After not leaving my house on my own for 2 years, I finally went down to the doctors and told her about my anxiety, panic attacks and depression. She was very sympathetic and understanding which I didn't expect. I honestly expected her to turn around and tell me I was being silly. But she didn't. She gave me a counselling number to call and some medication to help me in every day situations. I called the number and everyone I spoke to was friendly and understanding (which again was unexpected) and after around 8 weeks, I was given an assessment and started Cognitive Behavioral Therapy. I'm almost at the end of my sessions now ( I have one today actually) and I feel like they have helped me to see things in a different way. I have been taught various breathing techniques to help my in my day to day activities. Going out is still very difficult for me because I have cut myself off from a lot of people and don't feel like I have many people around me that I can depend on. I still have a long and bumpy road ahead. There will be ups and downs but I know that I'm capable of change. This is just a small glimpse into my story and there's so much more to tell. Mental illness isn't a joke. It took away the life I thought I'd have and robbed me of any confidence in myself and others around me. There are often days filled with grief for the life I should have had. Please take a moment to look around and really pay attention to your friends and family members. They could be 1 in 4. Mental illness leaves you feeling very lonely so it's important to note that a simple hello or compliment could really change someone's day. Lets Squash the Stigma and Speak about Mental Health. Feel free to leave your comments or experiences down here. I'll look forward to reading them. Thank you. It's so hard to stay positive sometimes but you must know that.